The idea for a memorial tree planting came about after our dear friend, Chris Foss, passed away in April 2009 . Chris was very fond of gardening and we decided that planting a tree in his memory would be a nice memorial for him. 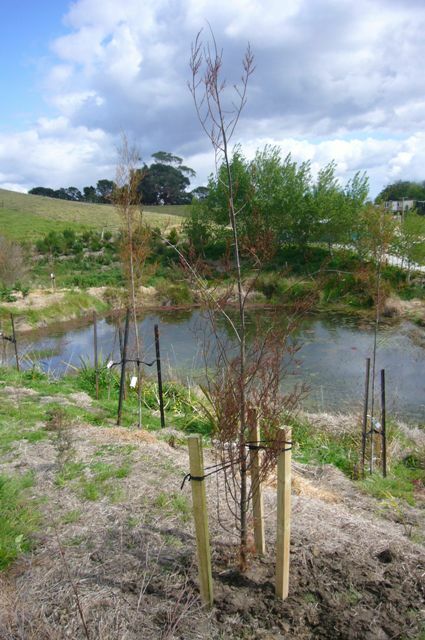 After discussing the idea with the consultant ecologist we decided to incorporate memorial tree plantings as part of the overall plan for CUE Haven and had the first tree planting in August 2009. Presently we are planting Dacrycarpus Dacrydioides also known as Kahikatea, as memorial trees. These are very slow growing trees and so we get about 5 to 9 year old trees from the nursery (which range from about a metre to over two metres high). The kahikatea are the tallest NZ native trees, growing to 60 metres or more, and they live several hundred years – so these trees will live on long after we have all gone. Kahikateas grow well in swampy areas so they are suitable for planting in the wetland areas throughout the year. There is no specific plot set aside for the memorial trees. As we are basically trying to recreate a forest, the memorial trees are scattered amongst the other native trees we plant. The memorial trees may be planted for any loved one who has passed away either in NZ or overseas, recently or long ago. 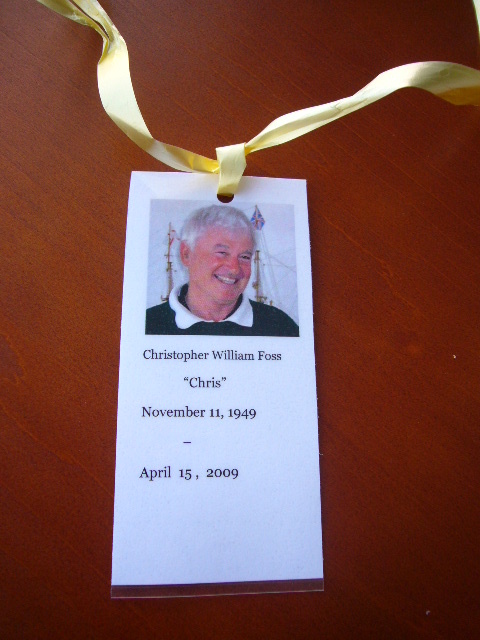 A bio degradable memorial tag which includes a photograph of the loved one, their name, date of birth and passing is attached to each tree. These same details are noted on the CUE Haven website’s Register of Memorial Plantings. We have found that the tree planting experience is quite cathartic for the family and friends of the loved one as it seems to provide some sort of closure. We encourage friends and family members to dig the hole (takes less than 10 minutes), plant the tree themselves and tie on the name tag. And they are welcome have a short prayer service on- site if they wish. As all trees planted as part of the re-vegetation program are eco-sourced, we are unable to entertain requests to bring your own trees for planting. We currently eco-source the kahikatea trees from a local nursery. The only cost to you is the initial cost of the tree and the name tag. Contact us if you would like to plant a NZ native tree in memory of a loved one and we can set aside a convenient day. If you are unable to plant the tree yourself, we will be happy to plant a memorial tree on your behalf and e-mail you a photograph of the tree we have planted. Currently, the cost of Memorial tree + memorial tag ranges from NZ $90+GST to NZ$120+GST depending on the size of the tree. Size varies based on availability. You may pay for the memorial tree via a bank direct debit or via credit card through Pay Pal. Please note that PayPal charges a processing fee. A GST invoice will be issued. I think this is such a beautiful initiative. A lovely way to remember someone. We would like to say thank you for the warm welcome you give our family and friends when we visit Cue Haven , your infectious enthusiasm and efficient organisation. We commend your vision and investment in the reafforestation of your land on Highway 16. The memorial plantings are an inspired idea and the grove of Kahikatea that our family and friends have planted since August 2010 have given solace and a refuge for us to remember young Duncan. With his life being so tragically shortened at three years, to have trees growing in his memory which will outlive us all, allows us to give expression to our grief while doing something positive. We trust that Duncan’s Grove will become a focus for future generations of our extended family and they, as well as other visitors to the property, will enjoy visiting the trees as they mature. Very Best Wishes for the future of the project. On 10th July 2010, Sushma, Arjun, Rishav and Ravi planted a memorial tree to remember Sushma’s father’s visits with their family in New Zealand. He loved his visits here and the clean green environment of Auckland. The tree is a ‘kahikatea’ which is a native of New Zealand and can live up to a 1000 years. Since Mahrukh and Tom are so wonderfully converting their farm into a nature reserve and a public trust for the future……..this tree will hopefully never be cut down. The planting of the tree was the family’s simple way of saying that “Daddum……..you meant so much to all of us ………we want your memory to always remain alive and keep inspiring us ………”. Dorab, Piran & I take this opportunity to thank you again for your immense kindness, understanding and generosity. Your hospitality was most sincerely appreciated. The Memorial Garden at Cue Haven is a wonderful way of dealing with the grief created by the loss of a loved one . A parent is irreplaceable and one is never quite prepared for this eventuality. Especially when you have not been around them when they took their last breath. The tree planting allowed me to have some closure and for the first time in months I felt a deep sense of peace. For me it was a remembrance of all the good times we had with him. I felt like we had left my wonderful Dad in the most amazingly beautiful and serene place. A small piece of “Paradise” on this earth, where I can go back and be close to him. Cue Haven provided us with a place where his Soul can be one with nature and he can rejoice in our simple ritual of remembrance. This tree will grow strong and tall, just like his wise presence had been in our lives. He was my protector, guide and mentor. The planting was more poignant for me as I could share this moment with my son and husband. who were also extremely close to my Dad. to spending time with our daughter Sam (then residing in Australia), to meeting up again with Tom and Mahrukh Stazyk who we had met while travelling in South East Asia, and to exploring a country we had never visited. just after Christmas and passed away in London (UK) at the end of January, 2009. Sam and I completed the adventure in January this year. During our visit with Tom and Mahrukh we visited CUE Haven and together we planted a kahikatea tree in Suzanne’s memory. to grow strong under New Zealand skies as part of the legacy that CUE Haven will become.